#1. Stabilizing the Kidney essence. 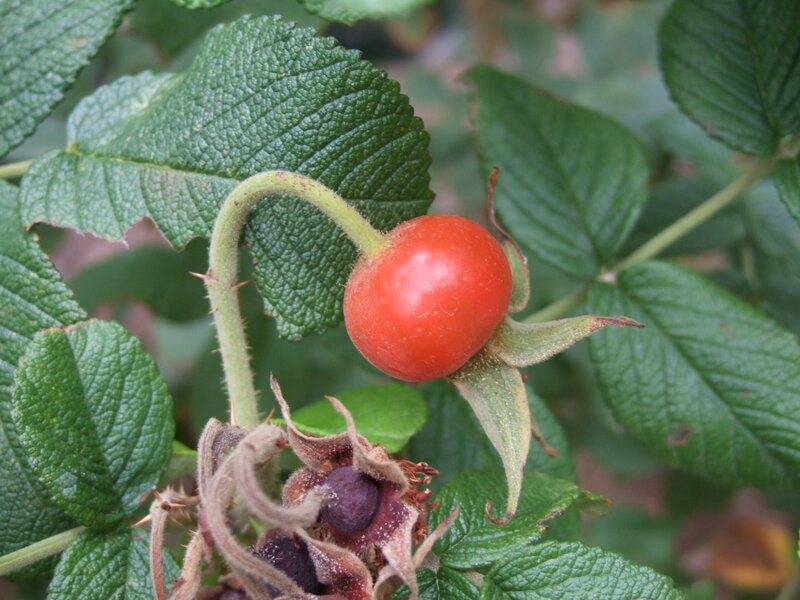 This means that rosehips can be used for general weakness in the kidney area (examples include chronic back pain, urinary fatigue, chronic hemorrhoids & other prolapses, decreased sexual stamina, or a weak and unstable feeling below the belly button). Basicially, rosehips tone and tighten the muscles and tissue in the lower pelvis. #2. Binding the intestines (cases of chronic loose bowel movements or chronic diarrhea). Below is a great recipe for Rosehip Jelly. 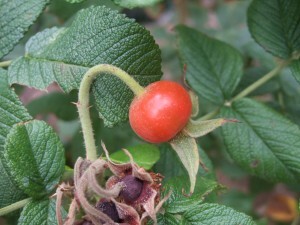 For the above conditions, you can also try drinking rosehip tea. Cautions: Use rosehips cautiously with common cold (they are astringent) and heat cases (yellow phlegm, red face, rapid pulse, fever). Overuse can cause constipation. If you happen to be easily constipated but feel like rosehips would be good for you for other reasons, it is still possible to use them if they are combined with other herbs at the same time to counterbalance your situation. Which other herbs? Well, that depends…. there are many possibilities. Just ask me. 1. Rinse the rose hips thoroughly. Cut off the scraggly ends and discard. 2. Place rose hips in a large pot. Add 1 1/2 quarts of water. Bring to a boil and reduce heat to simmer. Cover and cook for 1 hour (or longer), until rose hips are soft and mashable. 3. Use a potato masher to mash up the rose hips into a rough purée. Set up a jelly bag, or a large very fine mesh strainer, or 4 layers of cheesecloth over a bowl or large pot. Transfer the rose hip mixture into the jelly bag/strainer/cheesecloth. Let strain into the bowl for at least an hour. Squeeze the jelly bag or cheesecloth to get more remaining juice out. 4. Measure the juice. You will need 3 cups of juice for this recipe, so if you have less than 3 cups, add more water to the mixture (you can also add some boiling water to the jelly bag if you still have it set up, allowing more liquid to drain out). 5. Prepare canning jars. You’ll need 5 to 6 half-pint canning jars and lids. Sterilize the jars by either running them through the dishwasher, right before canning, or placing them on a rack in a large pot of water that you bring to a boil for 10 minutes, or by placing them in a 200°F oven for 10 minutes. To sterilize the lids, bring a kettle of a couple cups of water to a boil. Place lids in a shallow bowl and pour the boiling water over them. 6. 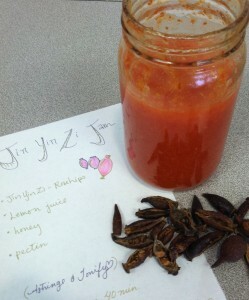 Place 3 cups of the rose hip juice in a large, wide pot. Add the lemon juice and pectin. Bring to a boil, dissolving all of the pectin. Add the sugar. Once the sugar has dissolved, add the butter. Bring to a hard boil (one that you can not reduce by stirring). The mixture will bubble up considerably. Boil for exactly one minute. Then remove from heat and pour off into prepared canning jars, leaving 1/4-inch space from the rim. 7. If any jelly falls on the rim as your pour it into the jars, wipe the rim with a damp paper towel. Place sterilized lids on jars and rings to secure. To ensure a good seal, and to guard against mold, you can process the jars in a water bath for 10 minutes (bacteria is already killed by the sugar). To process, place the jars on a rack in a large, tall stock pot. Cover with an inch of water and bring to a rolling boil for 10 minutes. Then turn off the heat, remove the jars from the water, and let cool. As the jars cool you should hear a popping sound as the lids seal. The lids should seal; if not, store in the refrigerator. So good and fun… Thanks, Montserrat for your help with this project!! This entry was posted on Monday, August 20th, 2012 at 6:41 pm	and is filed under Asian Herbs & Foods, Kidney Tonics, Sweet Treats. You can follow any responses to this entry through the RSS 2.0 feed. You can leave a response, or trackback from your own site. This is definitely one I am going to do in the fall! This recipe sounds amazing and delicious. Something I can make as well. Very creative. just wanted to saay fantastic blog!